Peter Gerard Stuyvesant and his wife Hellen Rutherford Stuyvesant were childless. As Stuyvesant aged, he worried that the distinguished family name would die out. His sister, Judith Stuyvesant Winthrop, had one male great-grandson. His name was Stuyvesant Rutherford. In the boy, Stuyvesant – who was the great-great grandson of Petrus Stuyvesant, Director-General of the colony of New Netherland – recognized his last chance. When he died in 1847, he left one-third of his imposing estate to the then 4-year old boy; on the condition that his name be changed to Rutherford Stuyvesant. The Sun later described Rutherford Stuyvesant as “a member of one of New York’s old families and a man of considerable fortune.” Stuyvesant spent considerable time abroad. Around the time that the Civil War drew to a close at home, he was taken with a startling European concept—the apartment house. Stuyvesant selected a broad plot on East 18th Street—112 feet wide on the south side of the block between Third Avenue and Irving Place—in 1869. The Sun remarked “it was not far from the centre of one of the best residential sections in the city.” The upscale location was intended to attract moneyed tenants—but it also brought problems. “The house” was completed in 1870—considered the first apartment building in New York. It was designed by Richard Morris Hunt who had produced the 10th Street Studios Building for James Boorman Johnston in 1857. That project provided residential and studio spaces specifically for artists. Rutherford Stuyvesant’s new Stuyvesant Apartments would follow that lead, providing four artists’ studios along with the 16 spacious apartments. Hunt designed the five-story brick and stone structure in the Victorian Gothic style. Despite curvaceous French balconies, contrasting brick-and-stone ornamentation, and a steep slate-covered mansard punctured by great, elaborate dormers; the Stuyvesant Apartments presented a brooding presence. Nevertheless the building was fully rented before the doors opened in 1870. To assure privacy, Stuyvesant and Hunt had built the interior walls especially thick to ensure apartments were sound proof. “But to make it so much of the space that could go into the apartments had to be sacrificed,” noted The Sun. The newspaper said that Stuyvesant, “being a man of wealth…spared no expense in making the house the best that could be turned out at the time.” The New York Times later reported “His apartment house had five stories containing suites of four, seven and nine rooms, many being of large size.” And according to The Sun “The best apartment in the house could be had for less than $1,800 and the lowest priced suite was $1,200.” The highest rent would equate to about $2800 per month in 2015. Downing Vaux worked in his father’s office in 1883. The 26-year old lived nearby in a room at 15th Street and Irving Place; but he ate his meals with his parents in the Stuyvesant Apartments. Downing was looking forward “to his marriage with a young lady to whom he was betrothed, and who is now traveling in Europe,” commented The New York Times on May 9, 1883. A missing person search across the city was initiated. Downing (named for Calvert Vaux’s first partner in the United States, Andrew J. Downing, with whom he designed the grounds around the Capitol Building and the Smithsonian Institution) was eventually found. He went on to have a successful career as a landscape architect. 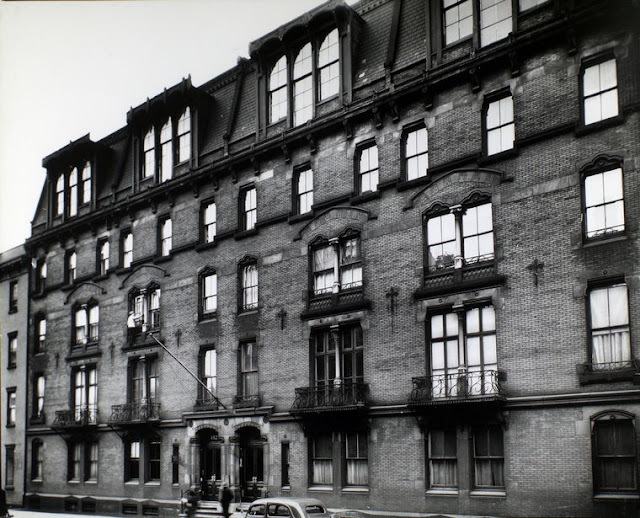 Calvert Vaux was still living in the Stuyvesant Apartments in 1889 when his Department of Public Works salary as was $3,000 per year; about $80,000 today. In the meantime the building filled with other socially-visible residents. Along with Calvert Vaux in 1885 White, Stokes & Allen’s Guide included on its “select list of prominent people” Walter Satterlee and Miss M. W. Kemble, also living here. Not only was the Rev. Edward O. Flagg highly esteemed in the Episcopalian church—he served both at fashionable St. Thomas’s Church and Grace Church—he was widely known as a lecturer and poet. In 1889 the four studios were inhabited by E. L. Henry, Mrs. Emily M. Scott, Julia Dillon and Frederick James. All of them exhibited at the National Academy of Design that year. Emily M. Scott would live in the building at least through 1908, and be joined throughout the years by artists like Domingo Mora, F. Louis Mora, Henry Rutgers Marshall, and Myra B. Spafard. 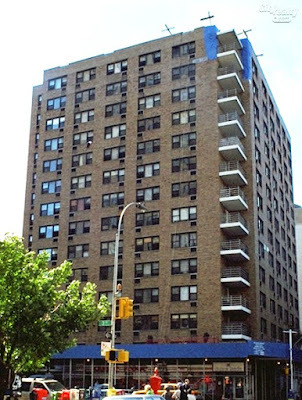 On Sunday night, January 3, 1897 Hal How died at the age of 72 in the Stuyvesant apartment. Doctors blamed his death on “paralysis.” Mary How would not survive through the year. On Friday, December 10 she, too, died in the apartment at the age of 72. Cornelia’s maid of honor was her sister, Kathryn Bayard Montgomery. Like most society girls, she involved herself with charitable causes—her favorite being the Stony Wold Sanatorium. Society pages routinely made note of her involvement with events for the facility. But the country’s entry into World War I changed life for all Americans, including the socially prominent. Kathryn turned her focus to war efforts and her brother, George Peabody Montgomery, enlisted in the Army. Not only did Kathryn become part of the ungainly-named American Committee of the British and Allies Comforts and Victims of War Fund; she established its New York office in the apartment. The war took its toll on romance, as well. 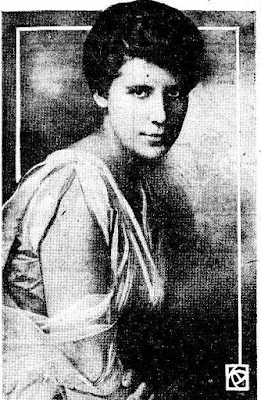 On March 6, 1918 The Sun reported that Lt. George Peabody Montgomery of the 305th Field Artillery had become engaged to Katharine A. Crane, of No. 410 Park Avenue. It would necessarily be a short engagement. Two days later the couple was married in Trinity Church. Following the war, the Stuyvesant Apartments continued to be home to artists, writers and poets. In 1920 artists Thomas Raymond Ball and Thomas Watson Ball were in the building; as was author and playwright George C. Hazelton. Among the plays Hazelton had written were The Yellow Jacket, his most famous; Mistress Nell; and The Raven, based on the lift of Edgar Allen Poe. Another author and playwright, Rita Weiman, lived here at the same time. She was caused concern in June 1922 when she sailed for Europe and her husband, Edgar S. Leo, entrusted her bulldog puppy to friends on Staten Island. On July 5 the puppy was stolen. Another literary pair moved in the building in 1923. William Rose Benet, the brother of Stephen Vincent Benet, was a poet who launched the Literary Review of the New York Evening Post with Henry Seidel Canby, Amy Loveman and Christopher Morley in 1920. In 1924 he became poetry critic of the Saturday Review of Literature. Benet’s wife, Elinor Wylie, was also a poet. Tragedy visited the apartment of Metropolitan Opera bass singer William Gustafson on the evening of March 10, 1931. The New York Times described the 42-year old as “an athlete and a 6-footer towering above most of his stage companions.” That season he had performed in the Met’s productions of Boccaccio, Die Walkuere, Madame Butterfly and as Fafner in Siegfried, among other roles. Gustafson and his wife had two children. That night the singer received a telephone call just after dinner. According to reports, “it aroused Mrs. Gustafson’s jealousy.” A quarrel broke out between the pair and according to police “Mrs. Gustafson is said to have upbraided her husband and to have informed him that she would take their two children and leave at once for Boston” where her mother lived. In her fit of jealousy, she telephoned Grand Central Terminal and reserved two berths. While she was still on the phone, Gustafson removed a .32-calibre pistol from a table drawer. Before his wife could stop him, he fired a bullet into his head. Mrs. Gustafson ran screaming out of the apartment and the superintendent of the building, Fred Ackley, telephoned for an ambulance. It was, of course, too late. William Gustafson was dead on the floor with the medics arrived. Almost amazingly, in 1935 Oliver Herford still occupied the apartment with his wife he had taken in the 1880s. It was there that he died on July 5, 1935 at the age of 72. William Dean Howells called him “the Charles Lamb of his day.” In a situation reminiscent of Hall J. How and his wife, Mary; Margaret Regan Herford died on December 9 that same year. She, too, was an author and playwright. Other celebrated names in the Stuyvesant Apartments during the next two decades included Frederick Van Wyck, author and antiquarian. He had lived in his apartment since, at least, 1932. Playwright Clayton Hamilton, writer and editor Mrs. W. C. Roberts, and artist Louise Bourgeois all lived here during the 1940s. Demolition of Richard Morris Hunt’s sound-proof building was a challenge. But by 1960 it had been replaced by a 14-story apartment house, designed by S. J. Kessler & Sons. Rutherfurd with a "u"! You should know that Tom. I just went back to my 19th century references--newspaper accounts, etc. The names is spelled "Rutherford" in all of them. I wonder when the change came about. The picture of the artist’s studio and f Replace is that of my great grandfather, Edmund Greacen who founded the Grand Central School of Art in 1922. Thank you for the memory. My grandmother, Nan Greacen, spoke fondly of that apartment. I lived there as an infant and toddler from 1948 until 1952. We lived in the easternmost artist's studio -- my father Paul Lawler was an artist (known for, among other things, Pam Am travel posters of the '30s). You could see the 3rd Avenue "El" from the studio window. It doesn't seem widely known that much of the film "Kiss of Death" was filmed there. It was Richard Widmark's breakout film in which he played the pyschopathic hood, Tommy Udo, who pushed a woman in a wheelchair down the first floor stairs. In its early years the building was derided as "Stuyvesant's Folly." Indoor plumbing and hot water in every apartment! I was trying to edit, not publish.